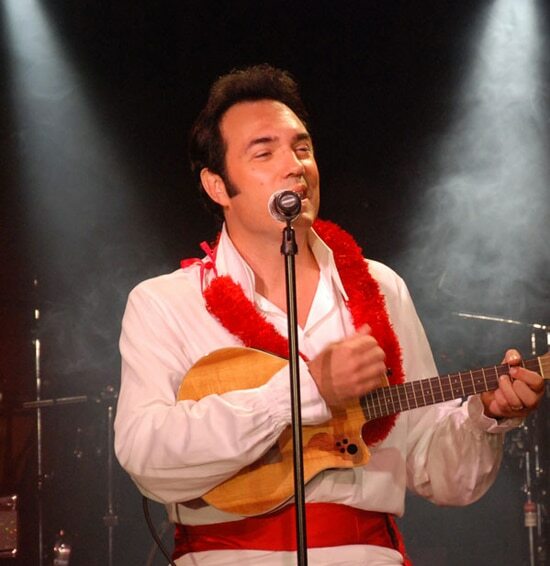 Ron Short is one of the most exciting and realistic Elvis tribute artists in the world. He moves, sings, and even plays guitar like Elvis did. Check out Ron’s “Characters” list below to see other tribute artists he performs as. Ron is available for special events, conventions, clubs, casinos, corporate and private parties. He can perform with a live band or his own background music, depending on what type of show you desire. Ron has performed for many different shows, clubs, casinos and special events including: Blue Hawaii Nights, Blue Hawaii The Show, The Magic Of Polynesia, Stars In Concert, Cirque Hawaii, Pro Bowl, The San Francisco Giants, Yahoo, AOL, Safeway, Coca-Cola, The Sonoma Valley Wine Festival, Hornblower Cruises, and Evening Magazine (PrimeTime TV Show). Ron can also be seen on the Travel Channel show ‘Blue Continent’ (Episode#5 – Rapa Nui & Hawaii) which you may see on the Travel Channel. Additional benefits and events in Hawaii: Ron has performed for Pro Bowl 3 years in row and has been on Fox TV Hawaii, Olelo TV, and the Travel Channel. He has done special events for Bank Of Hawaii, CrimeStoppers, Buddy Walk, Battleship Missouri, Waialae Country Club, Lions Club, Blaisdell Arena and many other top events. Ron is also a professional composer/songwriter and musician: guitar, drums, bass, keyboards. Ron has had original songs on The Tonight Show with Jay Leno and Container Wars (TruTV), and in the show “Cirque Hawaii” that was running for many years in Oahu Hawaii. James Bond (Ron Bond) – this is a great character for New Year’s, as an MC, or as a surprise character to liven up the crowd. Roy Orbison – Black & White outfit look. Pretty Woman, Only The Lonely and others. Country Ron – Johnny Cash, Tim McGraw, Keith Urban, Dwight Yokam, Alan Jackson, Toby Keith, Clint Black, Garth Brooks and others. 80’s Hard Rockers – Billy Idol, WhiteSnake, T-Rex and others. 80’s Rockers – Bruce Springstein, Paul Rodgers, The Cars, Bryan Ferry (Roxy Music) and others.